SoundLAN is IP Public Address system and IP Paging system based exclusively on IP native apparatuses that transmits the sound on the IP networks (LAN or WAN), so that you can install a public address system or a paging system in a simple way, quickly and with reduced installation costs. This solution for the installation of a public address system or a paging system is favorable especially in those cases where the areas where you have to install the public address system or the paging system have large dimensions so that it make expensive the realization of a traditional analog public address system or paging system. The IP public address system and the IP paging system do not require dedicated IP networks but they can coexist with any other type of system already existing on the data networks. The SoundLAN public address system and paging system is easy to install and to configure as it is based exclusively on native IP apparatuses that are connected directly to the network data without the need for interfaces or intermediate units to adapt them to the network. Moreover, these IP public address system and IP paging system, use a Peer-to-Peer protocol that do not requires any central management units or any management software installed on the network server. Each apparatus that is installed on the public address system or paging system independently manages the connection to the LAN and it is able to directly establish a connection with any other apparatus: ultimately it is not necessary to have a server installed on the network. The drawing shows how the minimum IP network on which to install a public address system or a paging system can be only a network switch which connects all the IP devices that are installed in the IP public address system or paging system. The heart of SoundLAN system are the audio gateways over IP that interface the IP network to the line of the speakers; each of these apparatuses receives the audio streams from the IP data network and it transfers this signal to a built-in audio amplifier that feeds directly the line of the public address speakers by means of its 100VL output. The IP audio gateways are housed in die-cast aluminum enclosures that have connectors with IP66 protection degree and therefore hey are suitable for outdoor installation; usually you can install these apparatuses directly in the area where are installed the speakers of the paging or public address system in order to make the most of the network connection and to minimize the use of the analog connections.. The Audio Gateway are also available in a variation that provides an output with a 0dB audio signal which can be used as an input signal to an external amplifier; this solution is used when you want to control by remote via a data link an existing public address system. To carry out the public address or paging systems are available different types of speakers that must be chose on the basis of the characteristics of the installation environment. 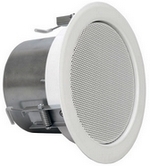 In particular we have horn speakers suitable to be installed outside in order to cover a wide area, speakers suitable to be installed recessed into the ceiling as well as wall-mounted speakers for indoor environments. The speakers for use with the IP audio amplifiers of the public address or paging system must have the line transformer for audio lines at 100V and are simply connected parallel on a pair of conductors. Sometimes, especially if you are installing the public address or paging systems in a small area, the use of the IP audio gateway may be excessive due to the high power of the amplifiers. For these cases ERMES can supply horn speakers, false ceiling speakers or wall mounting speakers that have inside both the audio amplifier and the interface to the LAN network in order to make extremely easy the implementation of a public address or paging system in a single point. In detail there is a POE horn speaker with a 10W amplifier that has IP66 connectors so that it can be installed without the need to access the inside in order to make the connections: the only operations necessary for its installation are the fastening of the bracket to the wall and the insertion of the network cable into the connector RJ45. Thanks to the web server function, present in these POE horn speakers, the programming of the apparatus is made with a browser directly from the network. 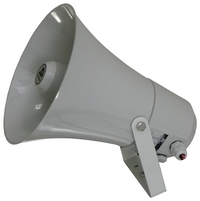 The use of this horn speaker is the easiest, quickest and most economical way to install a public address or a paging system in any area where an IP network is available. The simplest device that allows you to manage a sound system based on SounLAN system is the console table InterLAN-EO.PPM which is equipped with microphone, selection keys, function keys and speaker with control monitor function. This console allows you to send the messaggi to a single gateway, to groups of gateways or to all the gateways installed in the system (General Call). This console also has an auxiliary audio input for connecting to external sound sources (CD, TUNER, MP3 or similar) for the generation of background music. The SoundLAN system is then completed by ancillary apparatuses with different types of function such as the ability to manage pre-recorded messages that will be disseminated manually or automatically on the basis of programmable criteria as well as the ability to interface the sound system with external systems by closing the appropriate inputs on a specific unit with a clean contact.